There’s a very famous shot in the 1976 classic All The President’s Men of Woodward and Bernstein seated at a table, paging through stacks of pertinent documents, as the camera slowly pulls back to reveal the full size and scope of the room. It’s the movie in a nutshell: two journalists with their noses to the grindstone, discovering just how far back the conspiracy they’re investigating really reaches. 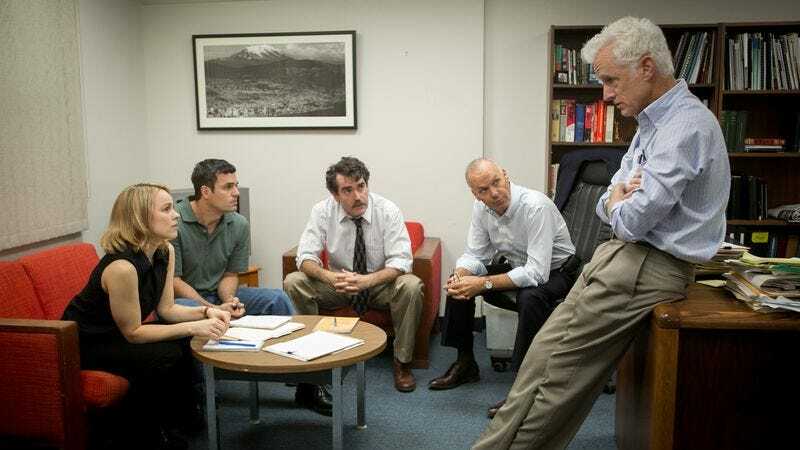 Spotlight, from writer-director Tom McCarthy (The Station Agent, Win Win), never conveys its themes with any such formal elegance; it’s more workmanlike, with a repetitive piano score by Howard Shore that labors a little too hard to underline the nobility of what we’re seeing. But that iconic shot, or one like it, wouldn’t be out of place here, as McCarthy’s film has been built in the same gripping procedural mode as Alan J. Pakula’s, with a comparable interest in the mundane daily duties—the nuts and bolts, the nitty gritty—of honest reporting. Like All The President’s Men, it’s a muckraker movie that celebrates the power of the press by actually showing journalists doing their job, pen and notebook in hand. The story being broke in this case is even more significant than Watergate. Spotlight dramatizes, in step-by-step fashion, how a group of reporters at the Boston Globe exposed the massive child-sexual-assault scandal in the Catholic Church, proving not just that pedophilia was a widespread problem among the clergy, but also that the conspiracy to cover up the abuse reached at least to the archbishops. The investigation began in the summer of 2001, when new Globe editor Marty Baron (played here by Liev Schreiber, as a man of integrity but little warmth) cajoled the Spotlight department—a small investigative unit, charged with producing bigger pieces over longer timeframes—into looking deeper into the settled case of an accused Catholic priest. As they quickly discovered, the problem was much bigger than one man of the cloth. By the time the story was printed, in January of the following year, the paper had confirmation of more than 75 priests in Boston alone who had assaulted children and were then protected by the church. The Globe won a Pulitzer for its coverage of the scandal, and many credit that first exposé with breaking the code of silence and encouraging countless victims the world over to come forward. Yet Spotlight isn’t especially concerned with lionizing its intrepid subjects, à la the recent and superficially like-minded Truth. Nor has it been conceived as an attack on the church, echoing the outrage the story itself provoked. What McCarthy and cowriter Josh Singer are interested in is legwork—the unglamorous business of sifting through old articles, going door to door for interviews, and hounding a tight-lipped lawyer to go on the record and provide access to his clients. Excitement is generated from little investigative victories, like when the team discovers that the church keeps extensive registries of all its priests and uses code words (“unassigned,” “sick leave”) to designate which of them they’ve moved around because of transgressions. The film introduces its bullpen of principle players quickly, establishing the trust and confidence Spotlight editor Walter “Robby” Robinson (Michael Keaton, back in a newsroom two decades after The Paper) puts in his team, Sacha Pfeiffer (Rachel McAdams), Mike Rezendes (Mark Ruffalo), and Matt Carroll (Brian D’Arcy James). McCarthy lets the personalities of these workaholics shine through, while still keeping the focus squarely on their professional lives; you can count on one hand the scenes that don’t depict them on assignment. (Even dinners and charity functions become opportunities to corner a potential source.) Furthermore, the film gains its sense of urgency not from any personal conflict or overt danger, but from questions of journalistic protocol. Do they sit on proof of conspiracy until they can establish how far back it goes? Or do they print an incomplete version of the story, so as not to risk the Boston Herald running with it first, getting it wrong, and sending the church into damage control? McCarthy, who played an unscrupulous reporter in the fifth and final season of The Wire, makes movies about people chipping away at the walls others erect between themselves and the world. (There’s an element of that even in The Cobbler, the director’s awful Adam Sandler vehicle from earlier this year.) In Spotlight, the barriers aren’t emotional, but social: This time, his characters are trying to maneuver around historic vows of secrecy, coaxing information out of people who have spent a lifetime repressing or concealing. 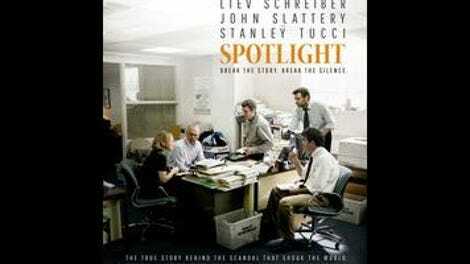 Unfolding chiefly within mundane interior spaces—the type of cluttered offices and courthouses that the late Sidney Lumet built a career around filming—Spotlight depicts Boston as a closed community, where insiders uphold and protect the traditions of their institutions. As one character notes, it’s not that anyone didn’t know the abuse was happening, it’s that they looked the other way. The movie makes the case that it takes an outsider—like Baron, a Jewish editor new to a Catholic town, or the Armenian attorney (Stanley Tucci) making sure these cases actually go to trial—to enact change in a city as insular as Boston. Exceptional, as always, with his actors, McCarthy has made a true ensemble drama, with nary a bum note in the sprawling cast. Just as there are no stars on the Spotlight team, there are no star turns in the movie; it’s too focused on creating a tapestry—a living, breathing conception of a city and its people—to accommodate any larger-than-life performances. (Mark Ruffalo comes closest to standing out, mostly by virtue of being Mark Ruffalo. The guy can’t not be compelling.) McCarthy celebrates the real, tangible results of investigative journalism, while managing to undercut the faint odor of hero worship by acknowledging that even the Globe played a part, for a time, in inadvertently suppressing this story. His Spotlight is that rare breed of newspaper drama whose admiration for the profession is rooted in a real understanding of it as a profession. To put it in journalistic terms, McCarthy’s as committed to the H as he is to the the five Ws.